People can now register their mobile numbers with the Telephone Preference Service (TPS) by SMS. The service was launched on 27th May this year. By texting TPS followed by their email address to 85095 the TPS will automatically register their number on the TPS. This has caused an obvious surge in registrations with some days seeing a tenfold increase and the highest day a whopping one hundred times the normal daily registrations. With registration increases like this, will there be any data left to call? There’s a reasonable steady flow of registrations on the TPS throughout the year, but the day of the launch of this new service saw a tenfold increase to 40,000 registrations in a single day. That’s not even the amazing part. 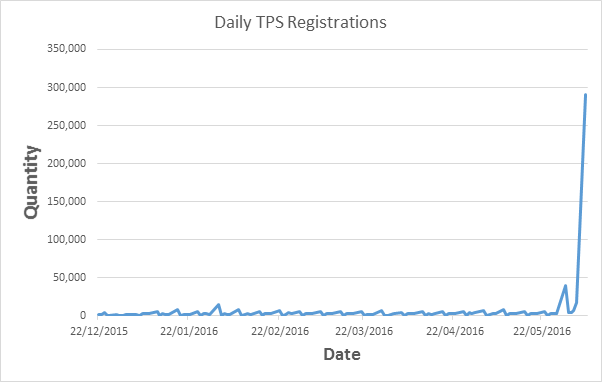 Registrations peak when the TPS is discussed in the media, for example when the TPS appears on the BBC programme The One Show registrations peak and the TPS website struggles to cope with registrations. On Friday 3rd June (updated on our systems on the next working day 6th June) there were over 290,000 registrations in a single day. That’s a 10,000 % increase in the daily average registrations. Will there be any data left to call? The TPS currently has over 18 million landlines registered which is about 88% of all household numbers, but only 3 million mobiles (around 3%). So for now, mobiles clearly appear to be the way to go. However, you can expect a massive surge in registrations over the coming 12 months with the ICO and TPS using registrations to tackle the nuisance call issue. So if you’re business relies on data to call and sell your products and services then you’d better start “making hay whilst the sun shines”, because the availability of data is surely set to shrink. If you’re not familiar with the term ‘Opted-in’ then get ready for it to be your new best friend. 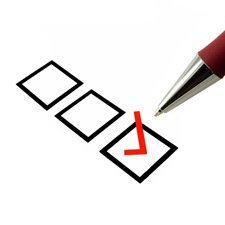 Opted-in is used to define data collected in a way whereby the subject has agreed to receive further marketing. Typically, since the birth of the internet, it has been generally accepted that opted in meant that a user signed up on a website or during a telemarketing call with the “…we may send you information from selected third parties”. Until recently that was all anyone ever looked for when buying and selling data. However, now the Information Commissioners Office (ICO) and the Claims Management Regulator (CMR) or “MOJ” as it’s more commonly referred to in the industry, have been sifting through the fine print of the Data Protection Act 1998 and the Privacy Electronic Communication Regulations (PECR) to make the point that this ‘opt-in’ is not acceptable in all circumstances. Do not send marketing texts, emails or automated voice messages to data you’ve purchased in (not to be confused with sending anything by these methods if the person you’ve spoken to has specifically asked for it or agreed to receive it). We’re sure right about now many people will be saying “yes, but what if...” and so the complexity begins. As we said earlier, opt-in data is in itself a whole topic of its own. If your business relies on data and you need one-to-one advice then we’d recommend you talk to someone like Scott Robert LLP who specialise in compliance matters including data. If ‘Opted-in’ is your new friend then ‘Consent’ is your new enemy. Consent is not a word many people have come across in data, but in time it will be the first thing you ask about. Consent is the nitty gritty behind whether data is opted-in and whether it is opted-in for one use or another, including being resold. To date, the industry is unaccustomed to answering questions about consent, but the ICO and CMR are not. The essence of the issue is simple... whatever you’re doing with that persons data, what consent do you rely on to do it? So whether you’re selling or reselling it, whether you’re texting, emailing or calling it the question of consent hangs around like a bad smell. Nothing has changed in terms of legislation, it’s just that the ICO and have finally decided to read the Data Protection Act 1998 and Privacy Electronic Communications Regulations (PECR). A little late maybe, but the new Data Protection legislation is due in May 2018 and consent will be a big part of that. It may seem a long way away, but you know that’s not really the case. What this space for more on consent.